I took a side trip on my way home yesterday to the Chumash Painted Cave State Historical Park north of Santa Barbara, CA. 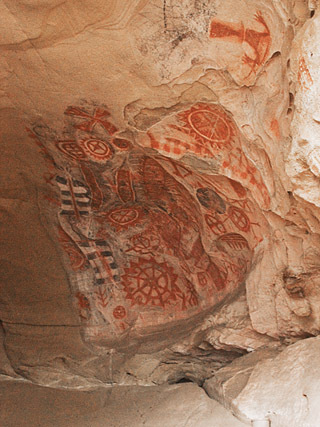 The sandstone cave contains drawings by the Chumash Native Americans that dates back to the 1600s. I love cave drawings and wanted to see them for myself. 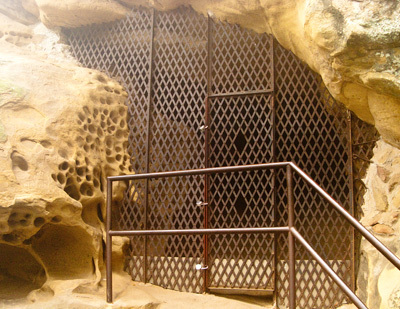 When I arrived, however, the cave entrance was protected by a heavy iron grid. I totally understand the thinking here, but the large diameter of my Olympus DSLR lens could not navigate the iron bars without having them in the shot. Then it dawned on me the the lens barrel for my Canon G9 compact would easily fit through the openings in the grid. And sure enough, they did. So I increased the ISO to 400, steadied the camera against the iron gate, and recorded a series of images with the lens protruding through the grid. Since I shot in Raw mode, I had lots of latitude in post processing to bring out the detail of the religious drawings. So, once again, carrying a compact camera with me in addition to the DSLR allowed me to get a shot that I might have otherwise missed. 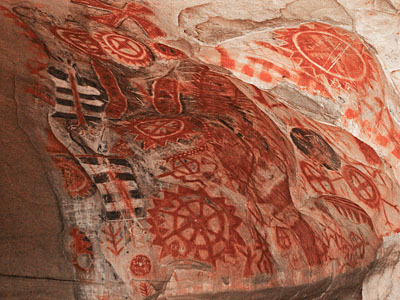 Photos of the Chumash Painted Cave by Derrick Story, captured with a Canon G9, ISO 400 in Raw mode. I've been in a quandry over compact cameras. I have a Nikon coolpix L12 which is a cute little camera but soooooo slow. I got it with bonus points from a credit card so I don't feel bad replacing it. My problem is what to replace it with. Everyone has been raving about the Panasonic Lumix LX3 but then I found out that Aperture can't deal with the RAW files yet. So now I'm back to which do I want. I may have to look into the G9 because those pics turned out great and that looks like a very difficult place to shoot. The Panasonic LX3 is a terrific camera, and my hope is that Aperture will be able to support its Raw files soon. Of course Jpegs aren't a problem now. And the Canon G10 is also outstanding. I would say those are the two leaders in my mind. So if you really have your heart set on the LX3, maybe just sit tight for a bit and see what happens with Apple. I share your quandary Teresa. Unless Panasonic makes it happen (e.g. DNG as Ricoh did), Apple doesn't seem to be doing anything for Panasonic. But 24mm vs. 28mm is a big difference. Thanks for the photo Derrick. I misspoke a bit about Aperture and Panasonic. Aperture does support the Lumix DMC-LX2. I've been waiting for G1 support which seems rather slow in coming. I still wonder if the camera vendors dropping proprietary formats wouldn't help Apple adapt faster. What is Panasonic gaining by keeping it proprietary? The bigger camera vendors can play hardball, but the smaller manufacturers lose at that game. And the 28mm was referring to the G10. Angle of views would be something like 74 degrees for a 24mm (equiv.) lens and 66 degrees for the 28mm. Or about 10 percent wider.